Warning Major Spoilers if you haven’t seen this episode! This was the best episode all season and maybe last season too. 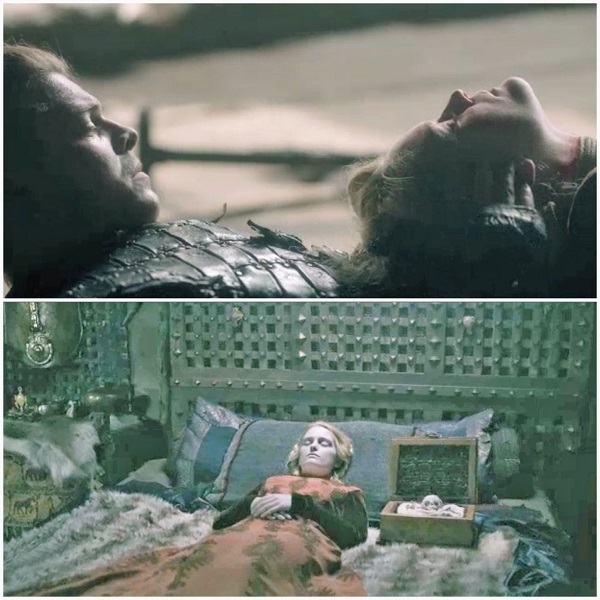 Several times, I assumed Hirst would stall the story and leave us waiting until next season – negotiations with Ivar? Freydis betraying Bjorn? – but he didn’t. The battle was not full of sophomoric blood and guts. It’s a great battle, a personal battle. I won’t apologize for not giving Bjorn his due all these years. His story was boring and directionless, but he completely owns this episode. Finally! But I’m strapped for space, so here’s the summary. 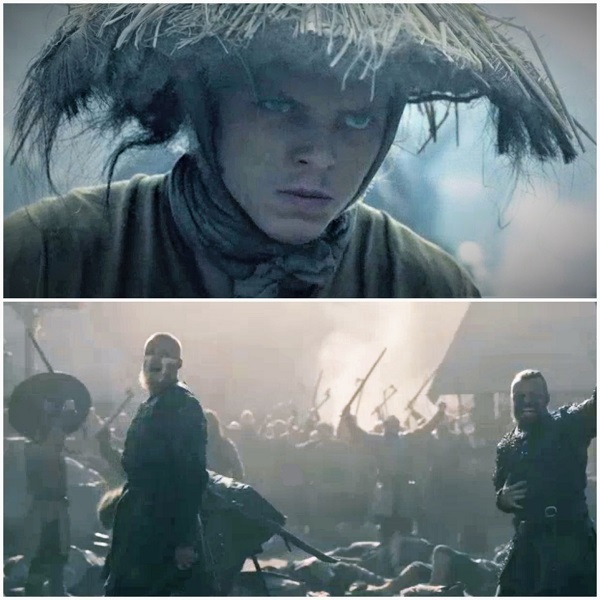 Ivar is fortifying Kattegat and his empire when he learns of the two armies bearing down on him. He claims it’s good, it somehow proves the gods chose him! But he’s shaken. He asks for Freydis’ forgiveness before the attacks. 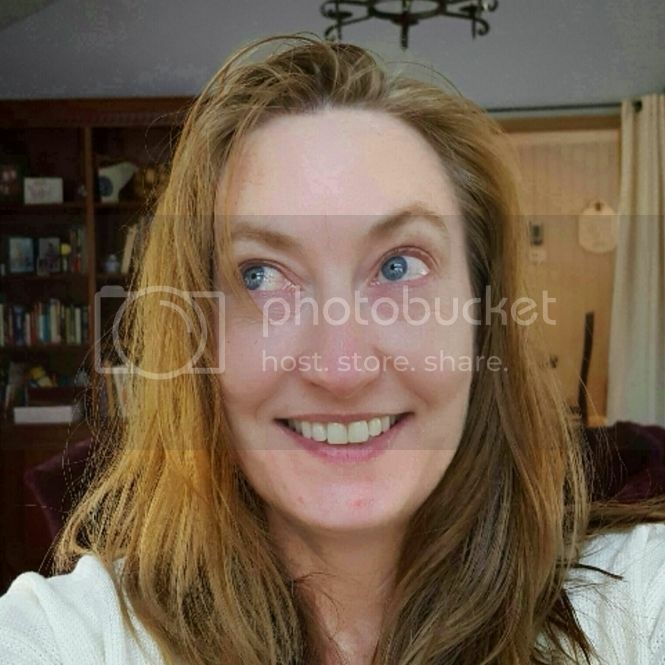 She says he has forgiven him and loves him. At first, I thought he truly wanted redemption from Freydis. But by the end of the episode, it’s apparent, he’s only looking for complete loyalty. 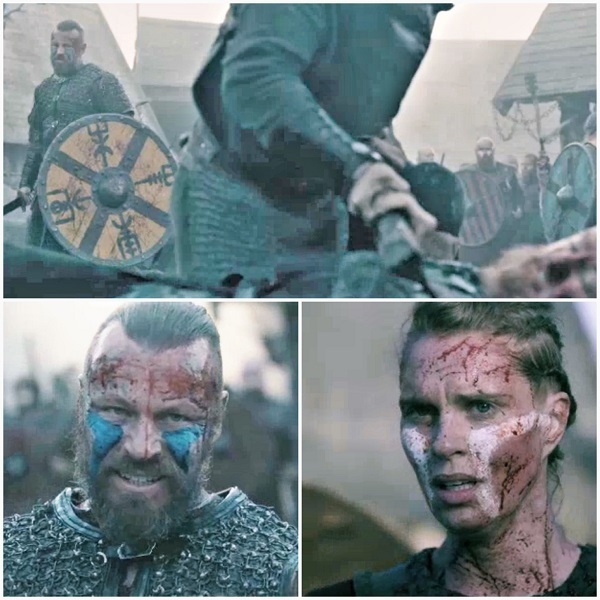 Lagertha, Ubbe, and Torvi leave for Kattegat. 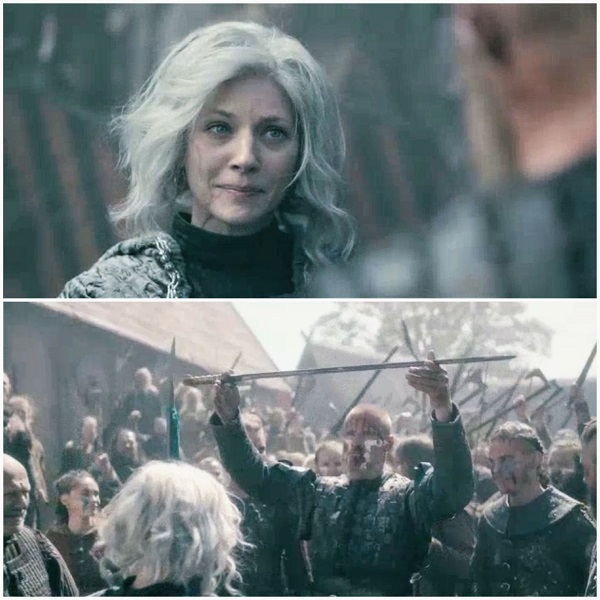 In another scene that feels forced, Lagertha tells Torvi, she now believes she was reborn and, “life is about suffering.” Maybe something will come of this next season. It was cool lighting though. On the outskirts of Kattegat, King Olaf wonders if they should negotiate terms with Ivar. He’s worried about Ivar’s wall and his cunning. Bjorn doesn’t even give reasons. He and Hvitserk are resolute. Hvitserk’s little Buddha has served its purpose. Magnus seems unsure of his newfound heritage when he hears the fireside stories of Ragnarok. Harald and Olaf’s troops are no match for Ivar’s defenses. Bjorn’s battering ram finally breaks through the gate with a small group. But a secondary hidden gate is dropped behind them, fencing them in. Bjorn orders a shield wall. This protected him, while his people are picked off by archers. Everyone died covering Bjorn instead of fighting through to the ramparts. This may be part of his survivor’s remorse later. Bjorn manages to break past Ivar’s soldiers and Grunnhild, having scaled the wall, creates a path for him to escape. Magnus initially hides from the battle, praying to God to save him. He realizes God is not listening. Once retreat is called, Magnus finds his courage in his new identity as a Ragnarson and attacks the wall. Harald pulls him back. After finally finding himself, Magnus is killed by a stray arrow. Harald feels like the father figure Magnus never had. Freydis lets Bjorn inside the fortress the next morning, and his men take Kattegat. 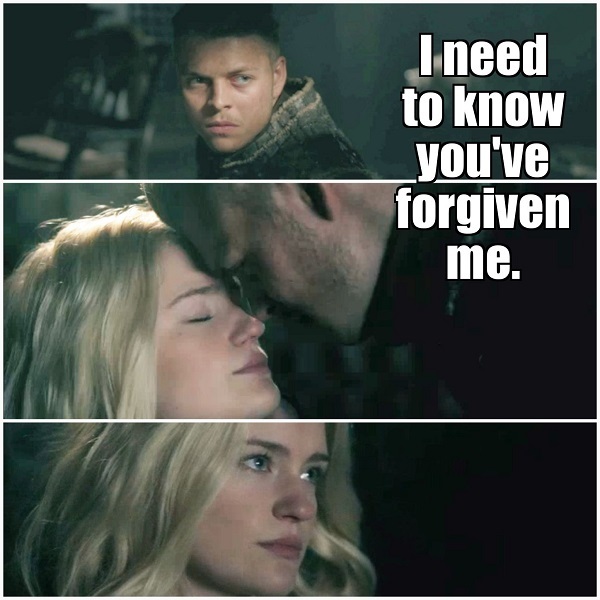 Ubbe arrives with Lagertha from Wessex, reuniting all the brothers, except Ivar. Harald is badly injured and Ivar escapes. I was left wondering if Harald has survived. It was difficult to choose favorite moments this week, but here goes. The acting in this scene is incredible. Bjorn breaks through the gates. 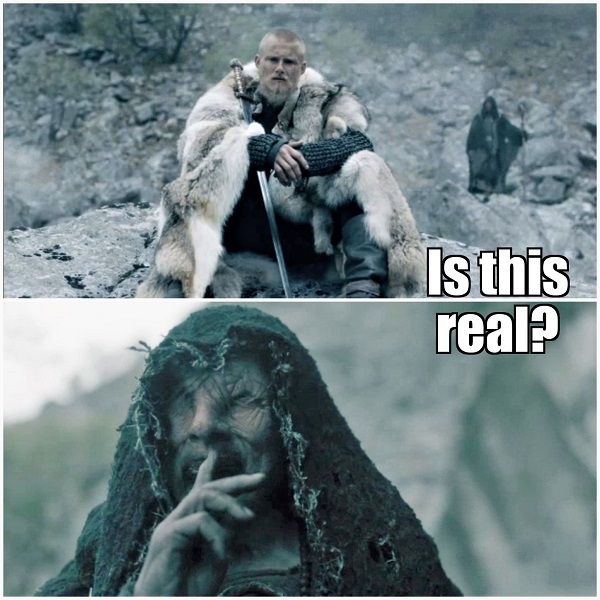 Ivar has a second door that slams down, trapping Bjorn. Check out the look on Ivar’s face. It starts with a child’s surprise, like finding a fairy in their net, while chasing butterflies. He can’t believe it. And then realization sets in. 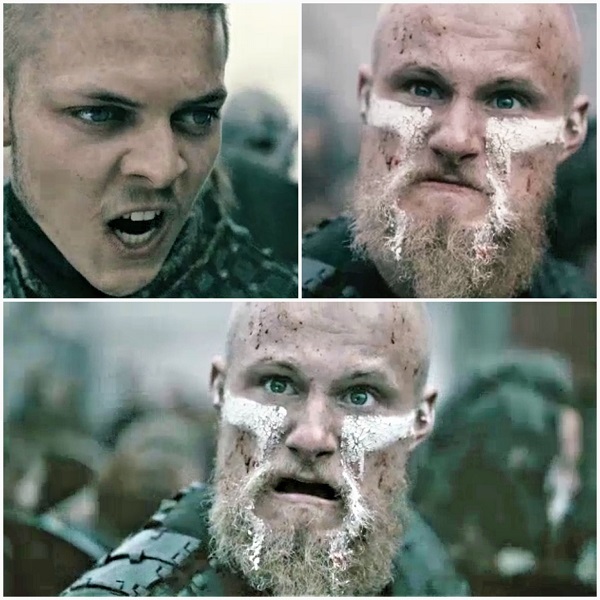 Bjorn’s face changes from anger to fear when he realizes his fate, and how much hate is in Ivar’s heart. The very next scene wins Bjorn the Oscar. After escaping the fortress and seeing his men retreat, Bjorn turns to Ivar’s men on the parapet. He is crying and appeals to the soldiers, reminding them that they were his childhood friends, his people, not his enemy. He’s there to save them, “Ivar is your enemy!” He now suddenly has a purpose in life bigger than avenging his mother and a throne. Ivar realizes that Bjorn’s appeal has worked. He has to take an archer’s bow to attack Bjorn. His men have lowered their weapons. Ivar responds by hanging people and demanding loyalty of the good folk of Kattegat. 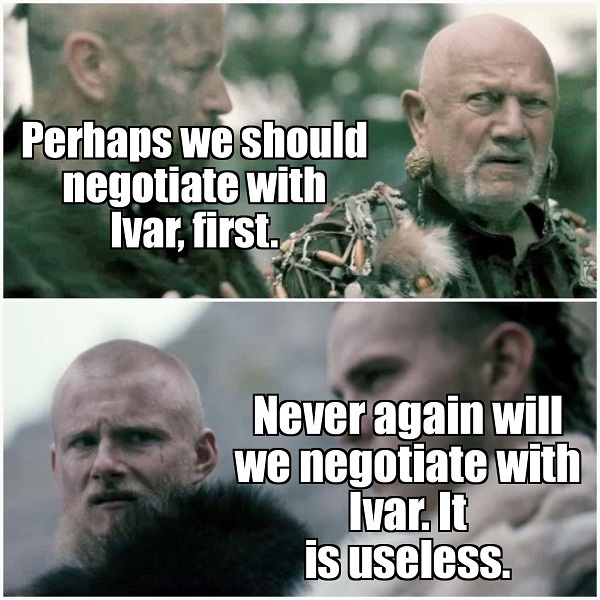 Ivar has completely lost it, expecting everyone to go down with his ship. Freydis visits Bjorn’s camp that evening and tells them of a secret opening in the wall. 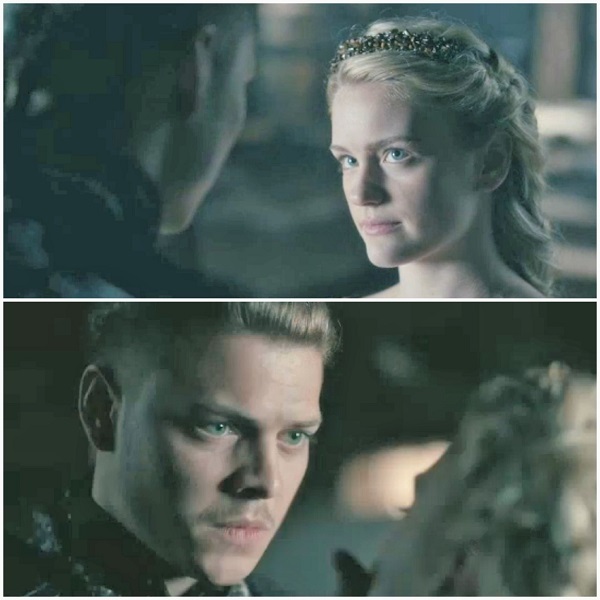 She tells Hvitserk about Thora’s death and Ivar killing her own child. They decide to trust her. Freydis arrives back to bed. She tells Ivar that Bjorn will attack the wall again. 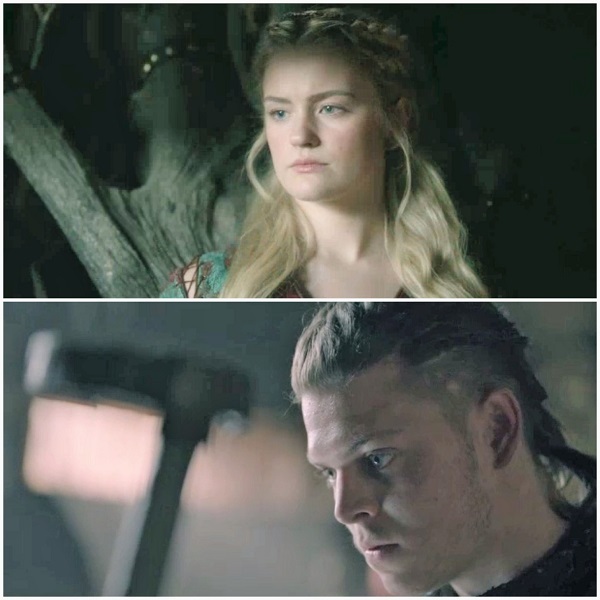 It’s implied that she went to Bjorn with Ivar’s permission as a guise. 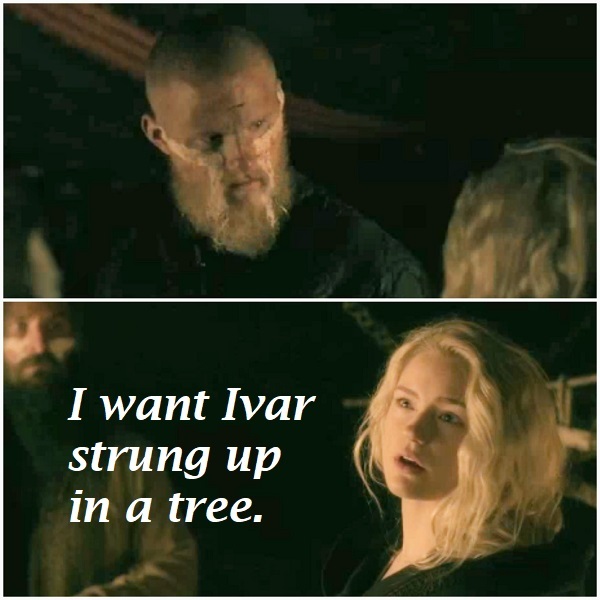 But it turns out, she gave Bjorn correct information and betrayed Ivar. 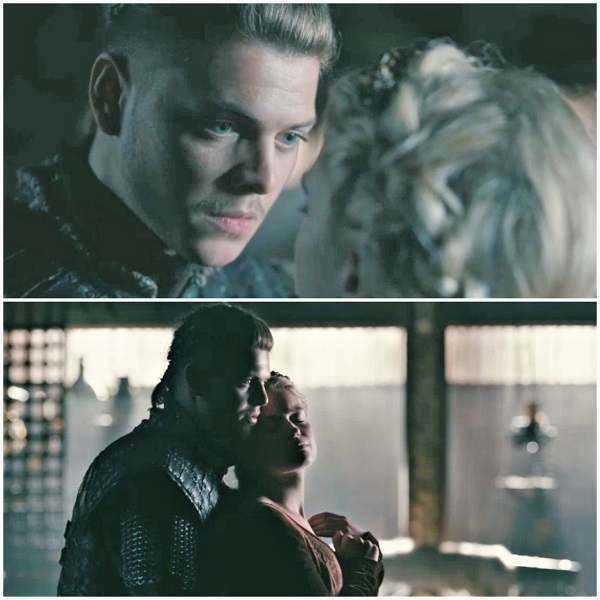 Just as when she was a slave willing to be a sacrifice for Ivar, Freydis calmly and boldly stands in front of Ivar. She tells him the truth. She let Bjorn inside the gates. He is hurt. She still never tells him the child wasn’t his. Did she think she would change his heart? 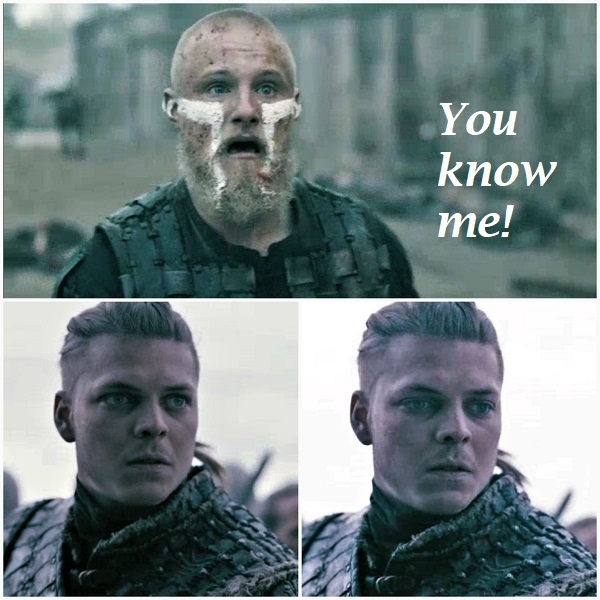 Ivar’s face changes from hurt, to emotionless. Not angry – just dead. He tells Freydis she is the “most beautiful thing that ever happened” to him. Then he strangles her. He says he’ll sit and wait for her (as Ragnar sat and waited for Gyda). He lays her out on her bed along with the bones of the child he believes is his, and leaves. To all those people who think I’m crazy for liking Harald so much, here’s my simple, yet redeeming scene. 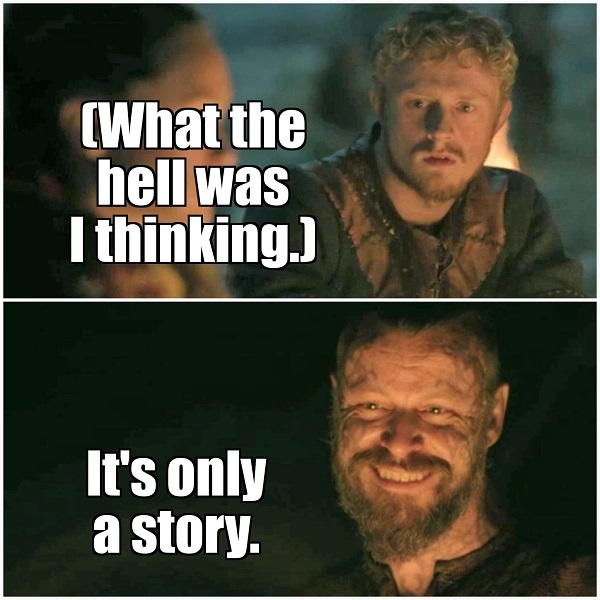 We know all the backstory between Bjorn and Harald, so no words are needed. Bjorn goes down on the second day of battle. Grunnhild can’t reach him. 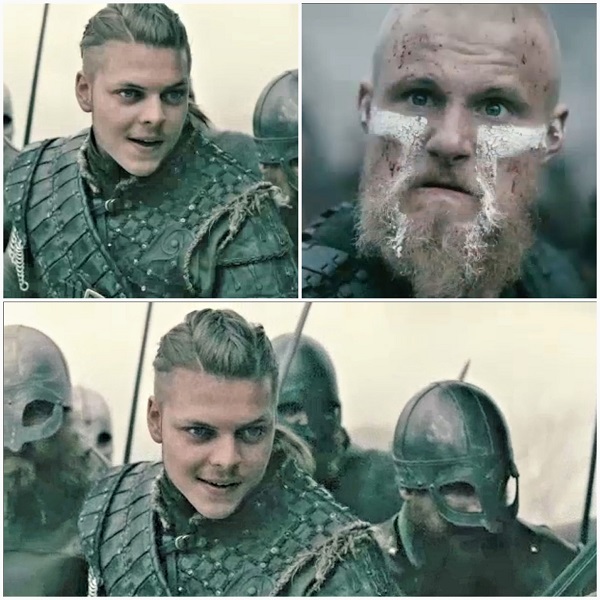 Harald sees the attacker and locks eyes with Grunnhild. He could let Bjorn die and take Kattegat and Grunnhild. But he has honor. He saves Bjorn. He takes a spear to the stomach for his troubles. He’s standing last we see him, but we don’t see him at the end of the battle, so we don’t know if he survives. Lagertha and Ubbe arrive in time for King Olaf to declare victory for Bjorn. Lagertha hands her son the sword Ragnar earned after killing King Horik. And we fade into a dream-like focus. Bjorn knows the sword came at a huge price. As he looks over the expanded borders of Kattegat from his mountain top, we hear Ragnar’s words about power. “Why do you want to fight? What are you fighting for? What do you see?” Bjorn came to Kattegat to avenge his mother and take the throne. It was his birthright. But Hvitserk told him something worse was happening. Bjorn gets it now. 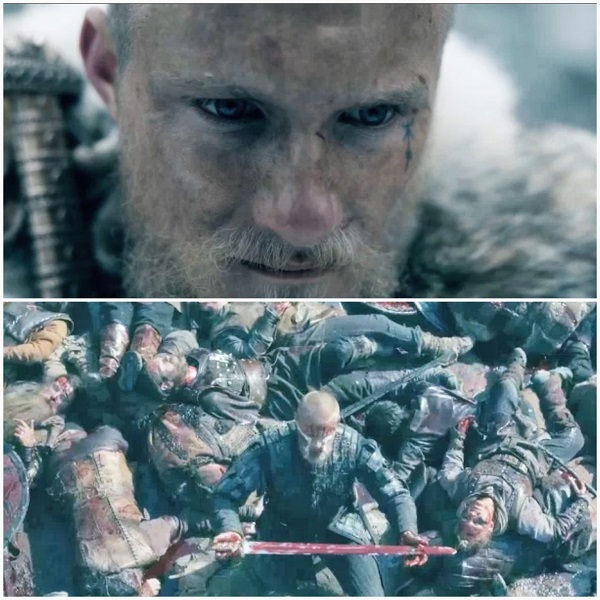 Ragnar only fought for his family and his community. When he was motivated by revenge against Rollo and Ecbert, it killed him. The Seer tells Bjorn his name will be greater than Ragnar. (Trivia Note: One of the first ship’s commission in the American Navy is nicknamed after him.) Bjorn asks the Seer if all this is real. The Seer places his fingers over his lips. He’ll never say. He can’t. He’s dead, along with the gods. Just as we start to wonder if this whole sequence was real, Ivar is carted away. So that part is real. Will Bjorn want to keep his crown, or will he hand it to Harald? Did your notice Ubbe brushed off Hvitserk with his horse-snort of disgust? 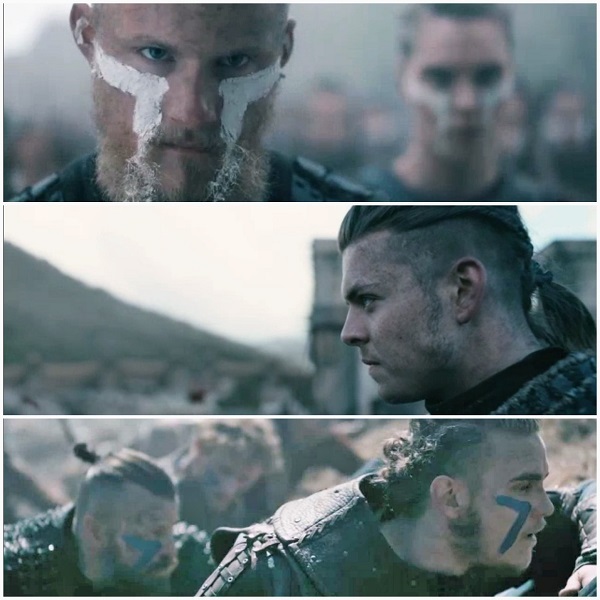 Will Ubbe and Hvitserk be alright? Stay tuned to Season Six to find out!